According to the reports, Video already makes up 64% of all internet traffic, and it’s growing up to 80% of all traffic by 2019. Facebook and YouTube are two game-changing platforms have become a questioned competition in online video streaming. YouTube is the world’s second largest search engine and the house of all your video content, while Facebook is positioning itself as an attractive substitute. Facebook even twisted their algorithm to give more visibility and reach for videos. According to the study, Facebook videos get more shares and interactions than YouTube videos and other video formats. 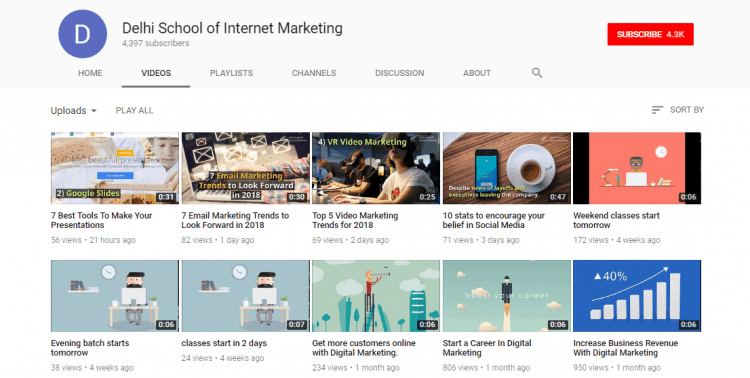 In this case study, you’ll see the difference between two and know the effective online video marketing. Facebook video reaches a high number of fans. Content that feels personal does well here. Use emotion and give a sense of community. On Facebook, advertisers can either create a video in-house or use an existing video to upload to Facebook’s native video player. It’s possible to customize the video description, thumbnail, budget, and audience to serve the ad to. Videos ads can be shown in the news feed for users, and they auto-play as the user scrolls down. Facebook charges by cost per 1,000 impressions (CPM) equivalent though advertisers can bid on a cost per view (CPV) basis and a “view” is counted after just 3 seconds. YouTube advertising is generally done through video campaigns on Google AdWords. The setup is called ‘TrueView’, and can be used to target specific channels or topics instead of targeting particular keywords. Advertisers can even remarket with video, meaning ads can be targeted to users based on their previous interactions with a specific video. YouTube charges per view. A YouTube “view” is charged after 30 seconds (or the full duration of the video, if it’s shorter than 30 seconds), or when a user engages with the video. YouTube is for practical, step-by-step information, while Facebook requires more concept-oriented content to be successful. YouTube video is last longer, while your Facebook videos disappear from the newsfeed after a couple days. YouTube doesn’t consider autoplays as “views,” whereas Facebook videos autoplay in the newsfeed (without sound) and record views after 3 seconds. YouTube will give you a better long-term ROI, than Facebook videos. Facebook has allowed its videos to be embedded on other websites; such content does not appear in the search engines. Facebook differs to YouTube in that it has the all-powerful ‘News Feed’ feature, which allows users to scroll through content almost indefinitely. It lets you interact with your friends and share videos, which is visible to anyone with whom you’re connected. It has the ability to introduce content to people’s lives even when they weren’t planning on discovering a specific video or clip. This is one of the ways Facebook differs from YouTube. YouTube is a very different from Facebook and one where the Content ID and monetization system is far more advanced. Facebook have non-engaged fans through social shares and the feed, but YouTube is a hub of engaged users who, if subscribed, can build into a following which is possibly more useful than any video following on Facebook. A little, YouTube does very well is the recommended video feature, almost always the highest form of traffic to new content. When videos are tagged correctly, suggestions should show up against similar videos. Choosing the platform that best suits your business really depends on what your goal to achieve from your campaign. Both YouTube and Facebook interact differently with fans and lead to different results and generate revenue in a different way. Compare short-term gains with long-term devotion and consider how to produce the results in different directions based on your objectives.